Overweight and overloaded trucks pose a very serious danger on our nation's roadways. When a truck has more weight than it can safely carry, stopping is much more difficult, and the truck is much more likely to get out of control when swerving to avoid a collision or an animal in the road. Overloaded trucks can damage the brake and steering system of the truck. An overweight truck is an accident waiting to happen, and when trucks are involved in accidents, the results can be catastrophic and deadly due to their massive size and weight. Trucking laws determine how much weight a certain commercial truck can carry, how heavy the load can be, what the combined weight of the load and the truck can be, how much weight can be on each axle, and how much weight can be on the tires. The amount of weight is not the only factor to be considered. 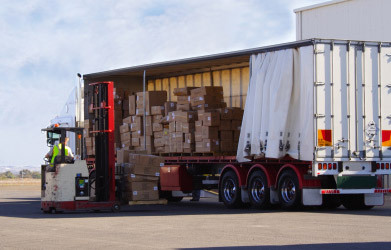 How the weight is distributed on the truck is also very important to truck safety as distribution of the weight also affects how the truck handles. We have all probably seen signs on bridges and under/overpass indicating the maximum weight allowed or the maximum height that can be cleared. These warning signs cannot be ignored as they are there to prevent damage and/or collapse of the structure. Weigh stations are set up all along the highways in the United States and serve as checkpoints where trucks are supposed to stop, get weighed and get inspected. Weigh stations will check for truck and load weight, illegal cargo, falsely reported cargo, and compliance with Hours of Service (HOS) laws. If an overweight truck is detected at a weigh station, the driver may only be given a ticket. This allows a dangerous truck with an unsafe weight right back on our roadways. Other violators may be detained until an overweight permit is issued or the weight can be reduced somehow. An overloaded truck takes longer to stop and is harder to control than one that is carrying a legal load. Overloaded trucks can jackknife or roll over in a sudden traffic maneuver, leading to deadly accidents that can affect vehicles in several lanes of traffic. Items on a trailer that have not been properly secured can fly off when the truck is traveling at high speed, becoming dangerous missiles that can strike other vehicles. Truck drivers may not even be aware that something has fallen off their trailer and continue driving. In some cases, witnesses come forward to identify the truck that dropped the cargo or equipment that caused an accident or struck a pedestrian. Dansker & Aspromonte of Paul Dansker is one of the top personal injury and wrongful death law firms in the New York City area. We represent victims of truck accidents in Manhattan, Brooklyn, the Bronx and Queens, on Staten Island and Long Island and throughout New York. Over the past 35 years, our attorneys have recovered hundreds of millions of dollars in compensation for our clients. At the law firm of Paul Dansker & Aspromonte in New York City, our accident attorneys’ hold trucking companies and truck drivers accountable when their negligence injures or kills innocent people. Contact us for a free initial consultation about your case. If you have been injured or lost a loved one in an accident involving an overloaded truck or improperly secured load, our lawyers are here to stand up for your rights. To speak with a highly qualified New York City truck accident lawyer, call 800-510-9695 or contact us online.